How do you spell "Michael Jordan" in Japanese? Can you write your own name in katakana? Or, have you ever thought you might like to know what characters you could use if you were to try writing your name in kanji? Here, we'd like to introduce 3 websites where you can input your name and have it automatically converted to see what it looks like displayed in katakana or kanji. The distinguishing feature of this site is the function which lets you convert your name into kanji. It doesn't just work with surnames, however. You can have your full name converted by inputting everything into one box (which is unusual). 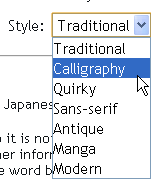 The name "Michael Jordan" is entered already, as a default setting, so let's try clicking where it says 'KANJI it'. As a result, you are given a list of what the site calls "Kanji candidates" - kanji that fit with each syllable of your name's pronunciation. From these, you can choose a combination you like to make up your own kanji name. When doing this, though, the thing that is of most interest is what each of these kanji means, isn't it? On Kanji Fandom, the meaning of each kanji choice is displayed when you roll the mouse cursor over it, which is really helpful. The kanji combination you choose, plus a list of each one's meanings, is displayed on the right-hand side. 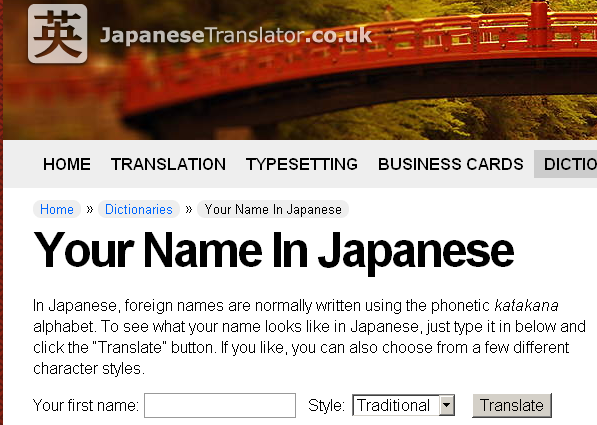 This is a tool that lets you convert your name into katakana. 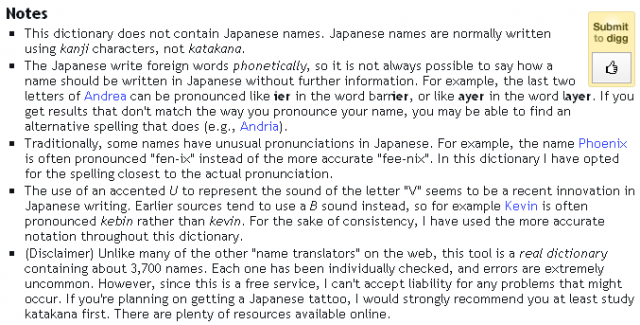 Some rules regarding pronunciation, mainly for when converting British/American names into katakana, are written here. 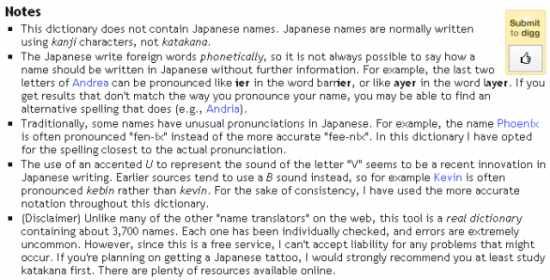 In cases where even though you may have spelled the name correctly, the katakana pronunciation given is different to the original English pronunciation, the site suggests that you might try a slightly different spelling. One of this site's distinguishing features is that once your name has been converted into katakana, you can choose a particular font design to display it. Please input EITHER your First Name or Family Name. On this site you cannot enter your full name into one box to get it converted. We tried inputting the name "Michael" again, as in the last example. At the very bottom of the top screen of this site, there is a menu called 'Convert Japanese Units'. Click on this and a "Convert" menu appears on the left side of the next screen. Click where it says 'English to Katakana'. 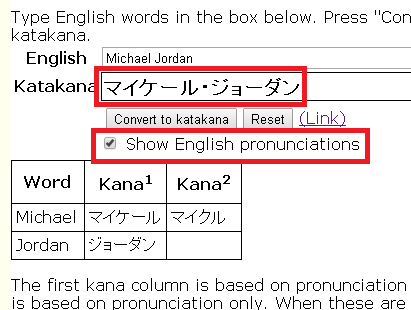 We'll enter "Michael Jordan", the same as before, then click 'Convert to Katakana'. Looking at the results screen, we can see that "Michael" is displayed as "マイケール". It would take a native Japanese speaker, or perhaps a Japanese learner well-schooled in katakana, to realise that "Michael" is usually written as "マイケル". It's difficult for a Japanese learner unfamiliar with katakana to judge whether or not this notation is correct. So, in this case, if you want to see how the katakana given compares with the English pronunciation, you can put a check in the box marked 'Show English pronunciations', then convert the name (again) to confirm. This feature is what sets this particular site apart. However much you read the pronunciation symbols though, in reality, the name "Michael Jordan" is transcribed as "マイケル・ジョーダン" in Japan. In order to check the notation, you could try comparing it with one of the other websites introduced here. Katakana display methods are explained to some extent on the Your Name in Japanese website, so you could try making reference to the results given by these different sites, before finally checking with a native speaker, if possible. The name you input may not always be rendered 100% correctly (or as one expects), but why not give it a try anyway, as you might find it fun! Re:How do you spell "Santana" in Japanese? Re:Re:How do you spell "Santana" in Japanese? Please try to type "Santana" (first letter is to be capital letter), although you may have tried it as well already. After typing "Santana", some Kanji characters appeared to chose. We hope you successfully will be able to chose the kanji for your name. Re:How do you spell "Helen" in Japanese? How do you spell "helen" in Japanese? Re:How do you spell "Polgari Daniella" in Japanese?